Looking for something new? Well~ we have some good news for all potato chips lovers out there! Gold Stack brings you its breakout product~ Honey Butter Potato Chips. This flavor was first introduced in Japan in 2012, but not until August 2014 where it became a big hit in South Korea, and since then, there has been a constant shortage of supply due to the high demand for the unique flavor these potato chips offer. 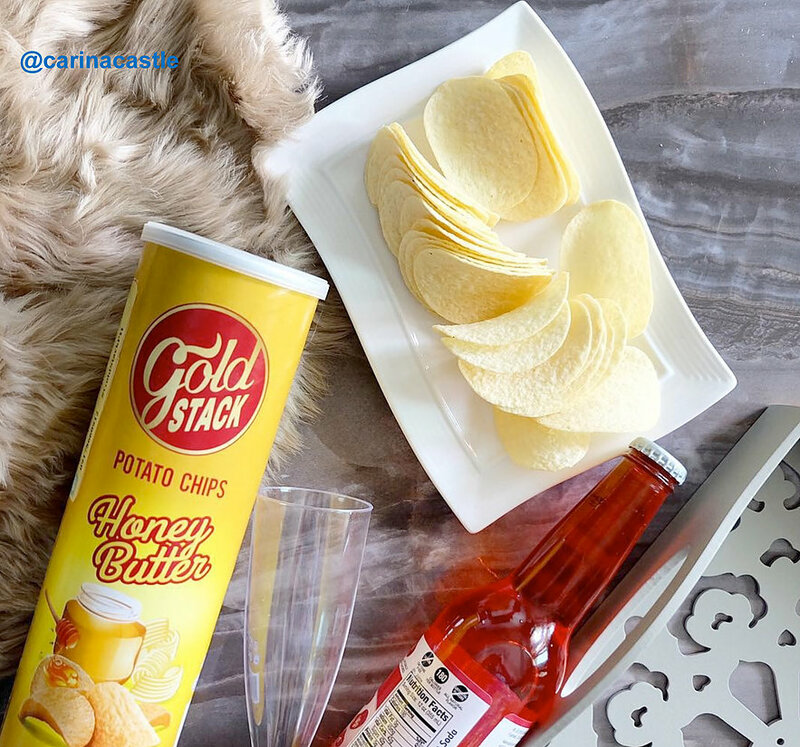 Who could resist crispy potato chips with sweet butter aroma and a touch of honey goodness? 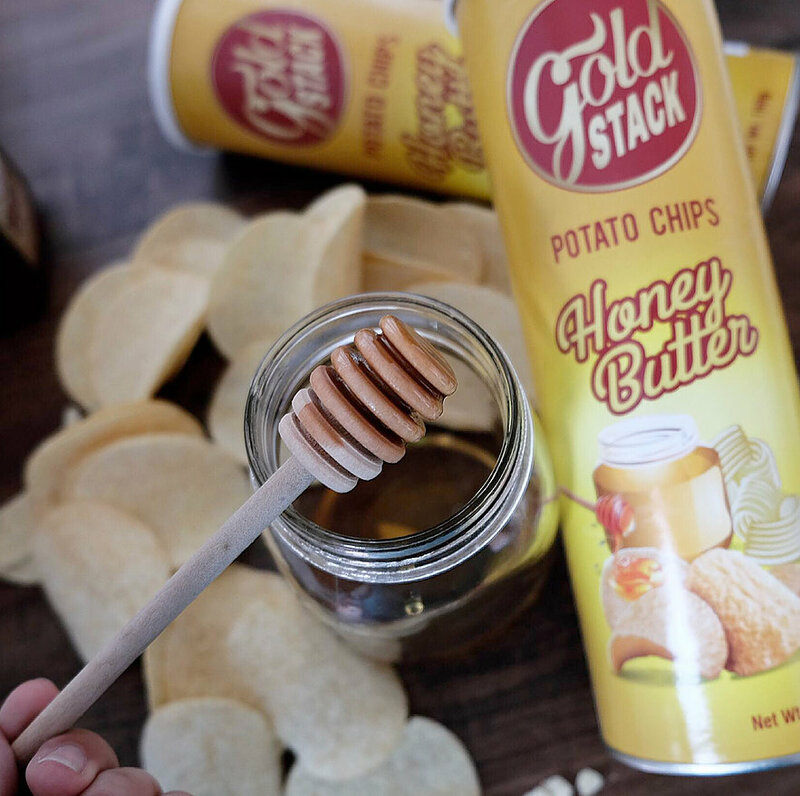 We know that most people would feel that the Honey Butter Chips would have a weird taste for the first time. This is indeed true, because we also felt that this chips has an acquired taste, the more you try to eat it, the yummier it tastes. One of the reasons would be that us Filipinos do not expect a sweet kind of potato chips to be considered a snack. We are used to having salty flavors that suit our appetite, and we don’t have substantial exposure to chips that are sweet and salty at the same time. 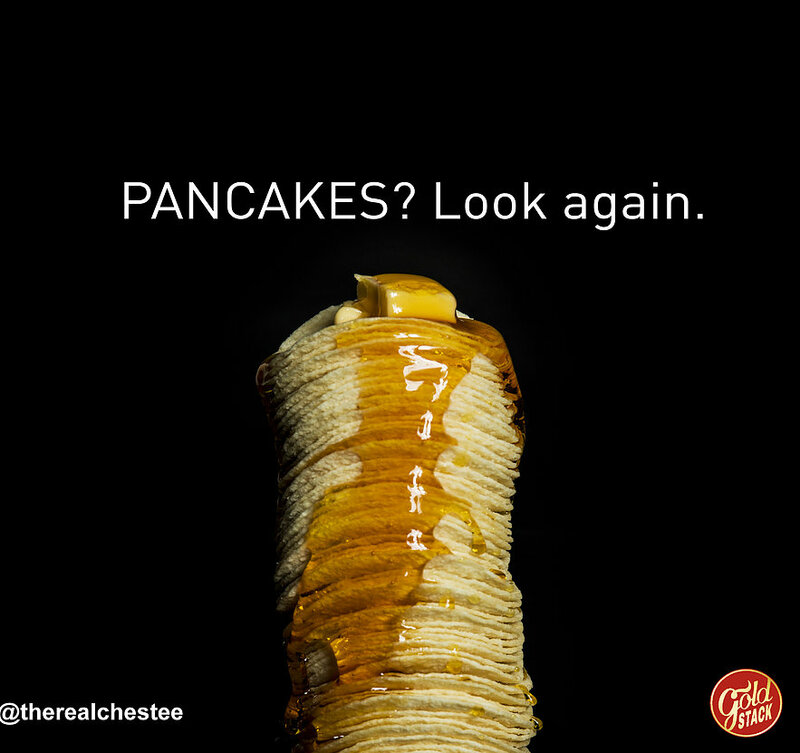 Gold Stack then comes into the picture to try and “change the norm.” To cite some examples, we all have those food or drinks that are of acquired taste, like durian or alcoholic beverages. When we try to eat or drink some more, the more we get accustomed to it; thus, finally loving how it tastes. Thailand, Vietnam, China and other Asian countries have produced their own version of the popular Korean honey butter chips. 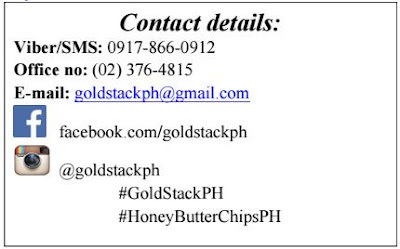 Gold Stack is the first to bring and introduce this flavor for potato chips to the Philippine market. 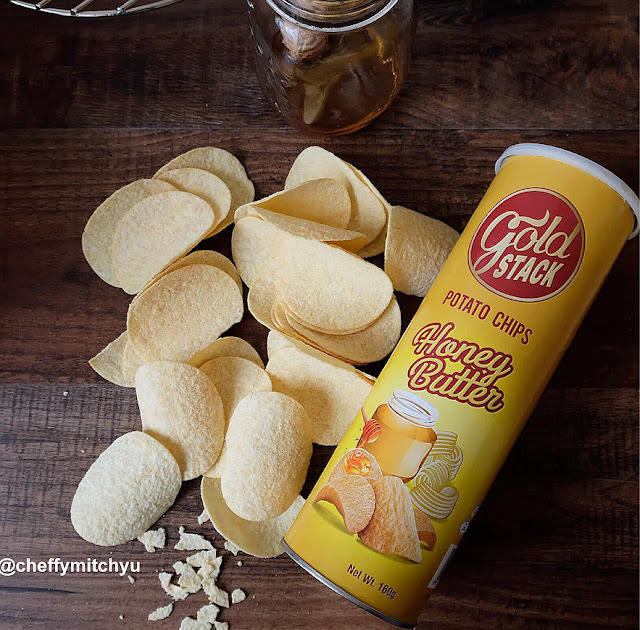 Our goal is to provide premium, delicious potato chips that cater to the Filipino taste buds. A new snack craze has finally arrived in Manila! A fun fact is that the honey butter chips in Korea became viral due to social media. They didn’t go for the traditional television or newspaper ads. With just a quick click on their phones, celebrities and locals in Korea raved about the yummy snack; hence, skyrocketing its popularity in a matter of months. That is our goal too. Knowing that we live in a country with a huge population and a competitive market in the snacks industry, one must stand out and exert more effort. Social media then plays a vital role in having a startup business. Since we still don’t have enough funds, using it as a marketing tool helps a lot informing everyone about our product. The most important thing in this type of marketing is of course~ you guys, the bloggers that gives the product not just its limelight, but also rather an existence that will last for the months and hopefully the years to come. The chips are packaged in a canister with a net weight of 160g. Healthconscious people need not worry as well, as the chips are proven to contain 0% trans fat and 0% cholesterol. No preservatives are added too. Moreover it is also ISO, HACCP, BRC and HALAL certified. Food bloggers, local celebrities, customers here and there have tried the latest snack craze and posted about it on their social media accounts. These are just perfect for anyone! 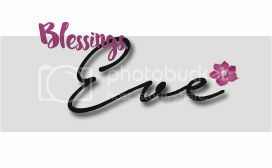 Great Eve! Happy you're doin well! Howdy David! Thank you. I didn't see you in Blogapalooza.